As mentioned in my previous post, Adobe has just released Lightroom 1.1, a free upgrade to their wonderful photo-workflow application. Correspondingly, I have upgraded my Custom Metadata Viewer Preset Builder, a web application that allows you to create custom metadata display configuration templates for use within Lightroom. This web-based tool is now superseded by my Metadata-Viewer Preset Builder plugin for Lightroom 2 and above. This description is presented with Lightroom 1.1 as an example, although the config files should work in any version of Lightroom 1.x, including 1.3.1. Data Presets are selected by this control, and are unrelated to the viewer presets this post is about. This post is the introduction and documentation for my template-builder application. If you have used the previous version, you'll find lots of new things here, including new metadata items, new display options, and even the ability to set label text. An example of Lightroom 1.1's metadata display panel is shown at right. The panel is capable of showing much more information about an image than anyone's likely to want to see at one time — over 100 items, such as the image filename, the latitude/longitude where it was taken, the shutter speed, a caption, etc.— the volume of which can quickly overwhelm. To whittle down the display to a smaller set of items, Lightroom comes with a number of built-in display presets (Default, All, EXIF, IPTC, Large Caption, Location, Minimal, and Quick Describe), each showing a different subset of the possible items. But because there are so many items that might be shown, chances are small that a built-in presets shows just the items you wish to see. This is where my web application comes in: with it, you can create your own display-configuration presets. The one shown at right is the one I made for my own daily use. I must be clear up front that this post is about selecting which fields to display, in what order, and with what labels. It is not about “this field is assigned this value” Metadata Presets that Lightroom already allows you to create and edit. (For what it's worth, you can access those presets via the “Preset” selector seen just under the red-circled “Jeffrey's View” in the screen capture shown at right. Custom metadata-viewer presets, from this or any source, are not supported by Adobe. There are no guarantees that the presets you build for Lightroom Version 1.1 will be at all useful with later versions of Lightroom. In fact, there are no guarantees that they'll be useful with any version of Lightroom. To build your own preset, use my web application to select the metadata items you want to see and arrange them in the order you prefer. You give your configuration a title (I used “Jeffrey's View”) and then a file is generated for you that you then download and install in one of Lightroom 1.1's system directories. 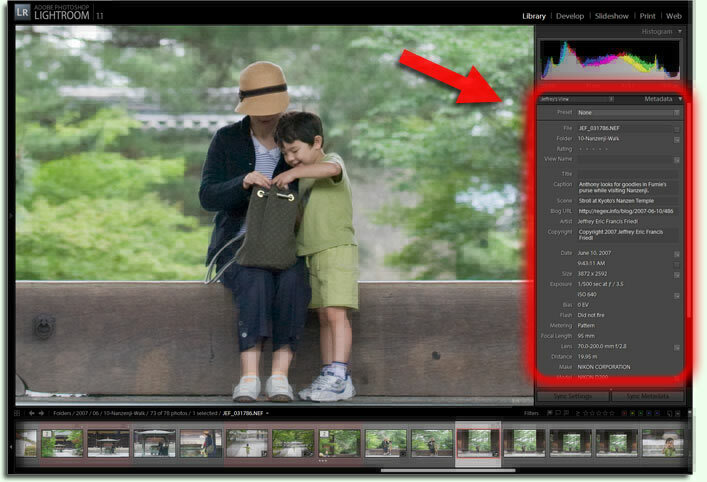 Your preset is available the next time you start Lightroom, in the Metadata Panel drop down box as shown at right. When you visit Jeffrey's Lightroom Metadata-Viewer Preset Builder (finally, that's the link to the application! ), you are presented with the view shown below. Select one of Lightroom's built-in presets to use as a starting base, or choose from among one of the extras I've included (“None,” “All 1.1 Supported Fields,” and “Jeffrey's View,” my own daily-use preset). Read the instructions, then press the “hide header” button to devote more of the screen to the preset builder itself. Create your preset, adding and removing items by checking them in the menu (seen at right), adding headers and rules with the buttons at the top of the menu, and by adjusting item options. An example view of your custom preset is shown in the lower-left of the application, with fake metadata filled in from one of my images, just to give a sense of how it'll look in actual use. In the custom list, you can drag items to reorder them, and you can drag them to the trash (the pink stripe at far the left) to remove them. This goes for header and rule lines as well. Once everything's as you like it, bring back the application's header by clicking the hide-header button again (which had become a show-header button) and enter a title for your preset. The title you choose here is what Lightroom shows in the drop-down list of presets (as shown earlier), so choose a short but descriptive title. Finally, press the “Generate Preset File” button. After pressing the generate-preset button, you're presented with a page from which you can download the template, as discussed a bit further down. The “Expand/Collapse All” buttons work on the menu list itself, revealing or hiding the 100+ metadata items supported by Lightroom. You can, of course, expand and collapse individual subtrees with the boxed “+” by head menu header item. The “Unhide/Hide All Options” items are for revealing each item's option list (when the item itself is revealed, of course). The box of options (like the red-boxed controls for “Dimensions (+ crop)” in the menu image above right) can be long, and are not often needed for most items, so by default they appear first as a “click to show options” placeholder. The “Add Header Text” button inserts a new header line into the template, which you can then click on to edit. “Add Rule Line,” unsurprisingly, adds a new rule line. Some items in the menu have more details than others. Here's an example that illustrates everything, with the display options showing (unhidden). Shown when not blank vs. Shown always — Some items, by default, are not shown by Lightroom when the item's underlying data is missing from the image. For example, even if a template includes the “Shutter Speed” item, Lightroom doesn't show it if the shutter-speed data is missing from the image. By selecting “shown always,” the label will be presented but the value area will be blank. Readonly — when this is turned on, editable items become static display items. This might be helpful during client presentations, but is of limited usefulness because any “click to edit” icons remain. Enter finalizes vs. Enter included — Normally while typing text into one of the metadata editable fields, hitting enter causes the input to be finalized, returning control from the field to the larger Lightroom application. When Enter included is selected, enter inserts a newline into the metadata value. Lines — how many rows the item value should occupy in the display. This is the most useful for free-format editable fields (“Caption,” “Copyright,”, etc.) and is the minimum size: the field grows as needed for longer text. Most other fields (“Rating,” “Filename,” etc.) use only one row regardless of this setting, so adding further rows simply adds padding under the value. Label — Choosing None is similar to Width Wide in that the value is presented using the full width of both columns, but the label is not shown above the value. When Custom is selected, the label text input field appears, allowing you to override the label with your own choice. There are some cautions about doing this, discussed below. By entering label overrides in this metadata configuration manager. The preset display shown at the top of this post is my personal “Jeffrey's View” preset, with many of the label text set with this application (method #3). Most changes were to make labels shorter (such as “Dimensions” → “Size” and “Capture Date” → “Date”) because the label column in Lightroom is only as wide as needed for the longest label, so making long labels shorter means more overall width is devoted to the values. I also changed some labels to change their meaning. For example “Copy Name” became “View Name” for reasons I'll explain in another post. “Job Identifier” became “Blog URL,” because I use that field to record the URL of the blog post or posts that an image was part of. I also used a blank custom label for a couple of items, so as to reduce visible clutter. One was the ridiculously verbose “ISO Speed Rating”, which I made blank because the value has “ISO” in it, and placed right below “Exposure,” it's certainly not ambiguous. I did the same with “Capture Time,” since “8:312:17 AM” right below “Date” is pretty clear. There's one concern you should be aware of if you intend to use multiple presets or share your presets with friends: labels changed with this application are seen only when the specific preset is selected, and override any changes made by the other methods. That means, for example, they override the language-specific labels found in localized versions of Lightroom. If you want to change a label for all presets (including the original built-in presets), use my Lightroom Configuration Manager instead of overriding while making a preset. As a convenience, the per-preset download page offers an extra “no label overrides” download if the preset contains label text overrides. That allows those who don't care for your label text (because, for example, they prefer labels in their native language) to use your preset without losing their labels. After pressing the “Generate Preset File” button, you're taken to a page that offers a download for a “.lrtemplate” file. You can bookmark that page, and share its url with those you'd like to share your preset with; they can then download the same preset, or use yours as a basis from which to build their own. For example, here's the page for my main daily-use preset that's been the subject of these examples. On the download page, click the link and save the preset file to disk. Before installing your first preset, you must first create a “Metadata Field Lists” directory in Lightroom's application support folder. To find that folder, from within Lightroom invoke the Help > Go to Lightroom Presets Folder command to bring up the “Lightroom” folder, within which you should create the “Metadata Field Lists” folder that holds the “.lrtemplate” file downloaded. Finally, drop the .....lrtemplate file you downloaded into the directory you just created, and start (or restart) Lightroom. The left side of the header in the Library Mode's Metadata Panel likely says “Default” — click it to see your preset among those in the drop-down list. All 100+ metadata items are new in this version in the sense that they all now have display options, but those items totally new in this version are marked in the menu with a bright “new” label. Click the [Expand All] button and scroll through the Menu to see them all. Some items seem almost identical, but are really quite different. For example, both the “File Path” and the “Folder” items display the name of the folder that the file is in, but they differ in how they interact with the mouse: clicking on one brings up the file in Explorer/Finder, while the other switches Lightroom to viewing the images in that same folder (something I find much more useful). The similarity among some of the items is one reason that the standard “All” preset really doesn't have all the items. It's also one reason that you'll want to take care when building your presets, so you'll get what you think you're getting. As you move from image to image in your library, the metadata items missing from an image are not shown in the metadata panel unless they're editable, or have the “Shown always” option selected. Click on an item in the metadata field list to automatically bring up the corresponding controls in the menu. The metadata viewer simply reports metadata in the file (or in Lightroom's database about the file). For example, Lightroom could potentially compute a value for “Focal Length 35mm” (full-frame-35mm-camera effective focal length), but it reports it only if that Exif field is actually present in the image metadata. Lightroom does not generally show metadata from the “Maker's Notes” section of metadata placed by many cameras. For example, Nikon cameras place the distance to the subject, if known, into the Exif “Subject Distance” field of JPG images it creates, but for NEF (raw) images, Nikon puts that data only into the Maker's Notes. Thus, Lightroom does show the subject-distance field for Nikon JPGs that have it, but not for Nikon NEFs that have it. The colophon for the first version tells how this project came about. This project was made much easier to develop by the Yahoo! User Interface Library, and two Firefox extensions: the most excellent Aardvark and mind-blowingly-supreme Firebug. It was a lot of work just to get this application working in a first-class browser like Firefox, not to mention then getting it to work in IE. I hope you'll find that it was worth it. I should’ve been more specific in my above comment -can I make the navigator and histogram modules disappear? I know it seems picky, but it’s critical for us to have as simple of an interface as we can manage. PLEASE let me know if you’re working on or know of a Metadata Browser editor. It’d be helpful to see Filetype, Date and Creator, but not the rest. I’m also hopeful that I can find or create an Image Processor which wouldn’t require Photoshop (it could probably use multiple exports from Lightroom with different settings (we need TIFF, DNG, small JPEGs, and a hard copy of everything and every time we shoot). An unexpected error occurred while loading a module. I am using Lightroom 1.3. Will your program only work on 1.1? PS I am aware that there is a problem with multi-line keywords. However, this error occurs even when I don’t try to use multi-line. Just edit your downloaded preset with a text editor and make the change. I’d like to know if I could use this tool to completely change the data fields for a project. I’m working on a directory and I need to ask all the photo subjects if the current info I have for them is correct. So, I’d want to change the field names to things like ID#, Address (5 fields), Phone, Degree, Specialty, Leadership Positions, and a Photo. I’ve been trying to get FileMaker Pro and Dreamweaver to work nicely together and I don’t have a clue about PHP. I bought FMStudio from fmwebschool.com but then learned that I’d have to buy FileMaker Server Advanced (expensive), or pay for FileMaker hosting – not in the budget. Will this tool allow me to edit the fields and more importantly export the database and display it on the web for the 650 people to view their data with their photo and then email me changes (or possibly edit their data on the website that I create). Thank you so much for what looks like a beautiful solution! Is there a way to increase the font size in the metadata panel? I tried increasing it using Edit > Preferences > Interface tab > Panel Font Size > Large, but the font size is still too small for me to read comfortably. I noticed a Metadata Viewer update to 0.29, is there a changelog available somewhere or would it be possible to include one with the possible future updates? I have been trying to download your Metadata Viewer Preset Builder for days , and I am very frustrated , since I keep having this Lua_pcall(L,2,1,0)==0 errror. Your Preset Builder is exactly what I want, it’s fantastic, all the info I need in one glance. Thinking French was my damnation, I switched to an English version of LR and got the LUA story again. It seems that for the moment I can only sort by lens, not by range of focal for a given lens (zoom of course) , say 17 to 28 for the 17/85 Canon EFS-IS, then 29-50, then 51-85 for example . My goal is to automatize imports (or at least select and batch process)with some minimal corrections such as vignetting , and purple fringe (which depends on focal length and aperture), waiting for LR to have a distortion correction. I found that using your Configuration Manager, I was able to increase the font size in the metadata panel. LR does not currently show a JPG or TIF file’s bit depth or embedded color space. Is there a way for you to enable viewing of those two items? Thank you for all this thourough info so far!! I was wondering if there is any way to export medadata from LR (without the images) into a simple text file (csv, etc.). This is not currently possible with the plugin infrastructure, but you may be able to build .xmp sidecar files and load them into Lightroom that way. It’s not necessarily straightforward and perhaps not even possible. I’m not sure; I’ve never done this. I really like the tool. I was wondering is there any way to display extra exif tables which are normally not shown by light room. For example on my E-3 there are focus points used, if the camera focused or not, etc. How would it be possible to include these? Hi, this is a very useful tool. I made my own metadata display but discovered that the — to ,e vital — information: the focal length in 35mm equivalent ist not showing, even though there is an option for it and the tag (FocalLengthIn35mmFormat) is in the image (as shown e.g. by Phil Harvey’s tool). Is there a workaround to display this tag? Hi, Jeffery. Am I missing something or does Lightroom not have a collapse all facility for the keywords tags. It’s driving me mad trying to use and manage a large keyword hierarchy in that left hand Keyword Tags panel. I have to manually collapse each hierarchical keyword to make space to scroll down the list. I’ve searched everywhere and tried various Ctrl/Shift etc. options while clicking the triangles – to no avail. A keyboard shortcut to collapse all of them would be a time and frustration saver. Hope you can shed some light. Thanks. This looked exactly what I needed to add GPS co-ords to my photos in the Metadata fields without buying additional hardware/plugins. I have GPS co-ords of sites visited from the car sat nav so why do I need all this other stuff? Can’t see these fields in the V2 Beta for lightroom either… Sometimes it’s easier to add manually rather than the hit or miss using Google over bushland! Hi Jeffrey, I stumbled upon your site and blog while googling about Lightroom export presets. Great site and photos (especially love the wet bird incidents). Thanks for allowing everyone access to these great tools. 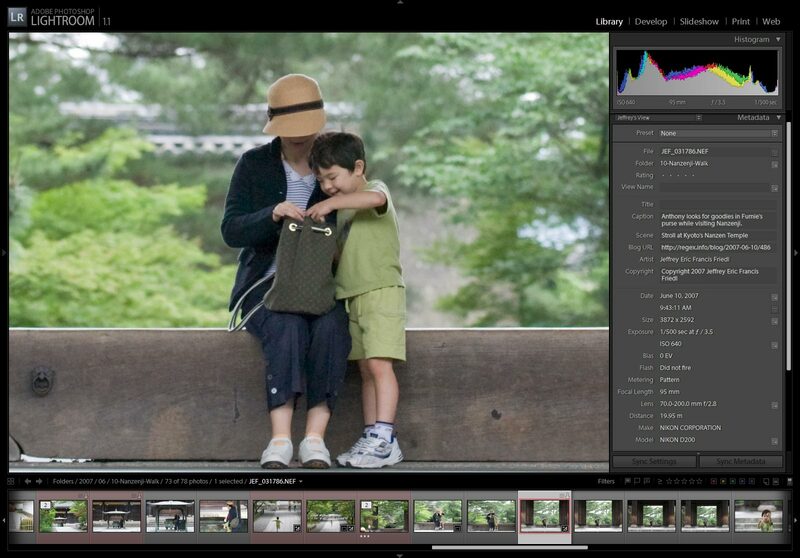 Are there any additional features planned for Lightroom 2.0 or works it just the same way as before? If you ever find the time to update this fantastic tool, please consider adding the plug-in metadata fields created by your export plug-ins. I was just trying to use this excellent tool to update my preset because I want to be able to directly edit the Flickr tags for my photos that have been uploaded using your Flickr Uploader, but I see that that particular tag is not available. Can it be added?? Super tool, thank you very much, but in my (german) Lightroom 2.1, the GPS field won’t show up in the list, regardless if there are GPS data in the photo or not. Might this be a problem of the localization? The external function to call Google Earth e.g. to show the spot is ok.
duh – I should have seen the comments above and would have the answer! Sorry about that. I just went to end of page quickly and didn’t see all of the postings. Firstly, many thanks for creating this! Secondly, I would be willing to pay for a simple, stand alone app for customising lightroom. As a big fan of your other work for LR I use export to Facebook/Picasa and your GPS-plugins. Q. Is there any way to add them to my custom metadata preset? I just came upon your great work! Excellent. Do you have any idea if it is possible to automate and convert crop factors to FF format so that you can read the 35mm equiv of what you have shot with a cropped sensor?